BlackBerry has had a rough time in the market over the past few years. Unfortunately, the company that was at one point in time, on top of the smartphone industry, is now struggling to make smartphones sell. Now, it seems as though the company is now taking another big hit from Facebook and Whatsapp. However, should you be interested about this? Today, we’ll talk about the news that we heard from Facebook and Whatsapp, how investors reacted to the news, and whether or not BBRY investors really should be worried about this change. Early this morning, it was announced that BlackBerry received word from Facebook that Facebook and Whatsapp will no longer support the BlackBerry operating system. Essentially, the updates required to keep the apps running on the OS simply aren’t worth the time since there are few phones that actually operate on the system when compared to the overall market. Considering the fact that Facebook is the world’s largest social network and that Whatsapp is the world’s largest mobile instant messaging app, many believe that this will be a huge blow to the smartphone business at BBRY. However, is that really the case? Will This Actually Hurt BBRY? Considering the information above, investors are worried that the fact that Facebook and Whatsapp won’t be supporting the BBRY operating system. However, in my opinion, the concerns are not validated. The truth is that BlackBerry realized late last year that its operating system simply wasn’t making the cut. Sure, BBRY had incredible technology and the security offered by the smartphones is great. However, the QNX operating system needed work and simply couldn’t keep up with the popular operating systems like Android and Apple’s iOS. As a result, last year, BBRY launched a new product known as the BlackBerry Priv. This was a smartphone like nothing else on the market. The Prive includes the incredible hardware and security that BlackBerry users have fallen in love with and is run on the Android operating system. When the Priv was first launched, orders came in at such a rate that BBRY had a hard time filling them. In fact, BBRY was forced to delay shipments of the Priv because of the overwhelming demand for the smartphone. As a result, it has been announced that the company will be creating more phones along the same lines. BlackBerry will be using its own QNX operating system in areas outside of the smartphone industry and taking advantage of the Android operating system for future smartphones. As a result, the fact that Facebook and Whatsapp will no longer run on BlackBerry’s QNX operating system is essentially null when it comes to BBRY sales. As mentioned above, some investors are concerned that Facebook and Whatsapp will no longer run on the BBRY operating system. As a result, we’re seeing slight declines in the market today. Currently (12:54), the stock is trading at $7.97 per share after a loss of $0.07 or 0.87% thus far today. Moving forward, I have an overwhelmingly bullish opinion of what we can expect to see from BBRY. The reality is that the company has unlocked the door to smartphone sales with the Priv, and since they plan on continuing with the Android operating system, I’m expecting to see more strong movement in that area. On top of that, you would be surprised to hear that its QNX operating system is being used in traffic lights, medical equipment, manufacturing equipment and more. At this point, it seems as though the company has come up with a plan that will help to drive profits! Where do you think BBRY is headed moving forward and why? Let us know your opinion in the comments below! 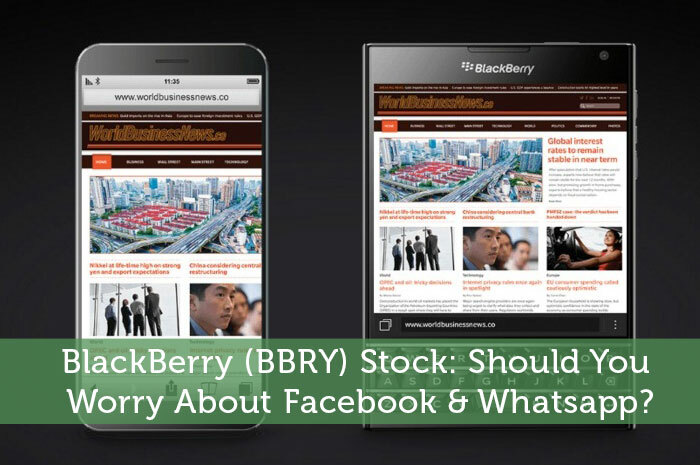 BlackBerry (BBRY) Stock: Should You Worry About Facebook & Whatsapp? QNX technology could likely be spun off some day for a sum larger than the current market cap of BBRY. I think the investment community is dismissive simply because it’s under the BBRY umbrella, and the sheep have been trained to hate BBRY.